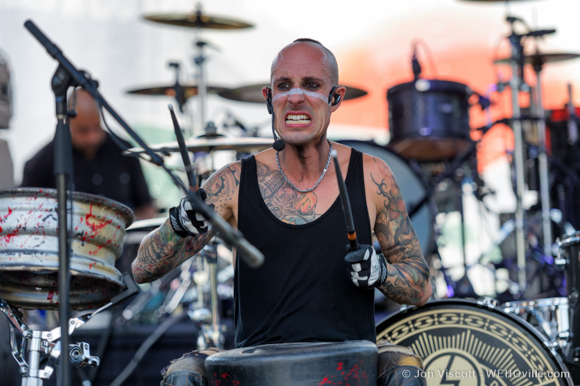 Street Drum Corps at Sunset Strip Music Festival 2013. The Sunset Strip Business Improvement District will have new management unencumbered by the debt incurred by the BID’s previous management that largely is associated with the Sunset Strip Music Festival. The West Hollywood City Council last night adopted a proposal by the city’s Economic Development staff that the city itself take over management of the business improvement district and that a new advisory board be appointed. Those recommended for that board include Lin Schatz of the Andaz hotel, John Terzian of Bootsy Bellows, Lee Maen of Innovative Dining Group, Norbert Relecker of the Mondrian hotel, Amanda Browning of Nicole Miller, Stacey Bowers of SoHo House and Brett Latteri of the Den on Sunset. Many of those proposed members were signers of a letter to the Council in May that expressed concern with the management of the business improvement district and suggested the Council consider suspending it. The biggest source of the SSBA’s financial problems has been the Sunset Strip Music Festival, which launched in 2008 with the goal of promoting tourism to West Hollywood by calling out the Strip’s history as the birthplace of rock and roll. The festival lost $577,000 in 2012 and $389,000 in 2013. In 2014, the SSBA contracted with the Nederlander Organization, an event management company, to manage the event and expanded it to two days. Losses grew to more than $1 million last year. The Council’s decision leaves open the question of whether of whether debts incurred by the SSBA and its Sunset Strip Music Festival will be repaid. The City of West Hollywood and the business improvement district and its new advisory board are not party to various contracts associated with the Sunset Strip Music Festival that are the source of those debts. The SSBA’s advisory board earlier this month approved a settlement that calls for it to repay an advance loan of $150,000 from Nederlander in increments of $10,000 a month, with the revenue coming from advertising on banners on city-owned poles on Sunset Boulevard. Under the agreement it also would have make payments of 30 cents on the dollar on another $622,000 that it owes Nederlander associated with the festival’s losses. The SSBA contracted with Brown-Forman Corp., manufacturer of Jack Daniels, to advertise that alcoholic beverage on the banners and has agreed to divert up to 25 percent of its $408,000 a year in ad revenue to pay its bills to Nederlander. However, with the BID’s new management, the SSBA does not have the right to revenue from banners on city-owned property. In its contract with Nederlander, the SSBA agreed to accept responsibility for debts generated by the Sunset Strip Music Festival, a separate incorporated business that it wholly owns. The Music Festival owes almost $520,000 to nearly 30 businesses with which it contracted for services. They include SSBA members like Whisky A Go Go, the Viper Room and the Roxy as well as business that provided parking and event organizing services. And it owes $250,000 to Mikael Maglieri, the SSBA advisory board chairman and owner of Whisky A Go Go and the Rainbow Bar and Grill. Maglieri loaned that money to the organization in November 2013. Issues with SSBA’s management of the district have led to significant turnover on its current board, with more than half of its 15 members resigning in the past 18 months. Currently there are six open seats. An independent analysis of the management of the Sunset Strip Business Improvement District showed major budget discrepancies, failure by Executive Director Todd Steadman to follow required financial procedures, significant unbudgeted expenditures and execution of contracts involving city property without the city’s knowledge or the approval of the district’s full advisory board. The new management also means a new assessment structure for businesses within the district. Those businesses are assessed a fee collected by the city, with the money used to provide public safety safety and cleaning services and marketing services for the area. The SSBA board voted earlier this month to reduce the current assessment levels by 65 percent for large nightclubs and bars and restaurants Smaller bars, hotels and small restaurants and liquor and convenience stores would see their assessment reduced by 60 percent. Retailers would see their assessment decline by 20 percent. But the city staff suggested reductions by range of assessment, with 50 percent for those ranging from $4,000 to $35,000, 33 percent for assessments of $3,000 a year and 20 percent for assessments of $250 to $2,500 a year. That would represent an 80 percent reduction in assessment revenue to $274,000. The City Council authorized the formation of the Sunset Strip Business Improvement District in 2004 after the BID received the support from businesses in the area representing a majority of the revenue there. For the last several years the SSBA has served as its advisory board and Todd Steadman as its executive director. Councilmember John D’Amico, who questioned whether there was any assurance the new advisory board would provide better management, voted against the restructuring last night.